TEMSA members receive a copy of TEMSA’s bill tracker in the e-mail newsletter for members. 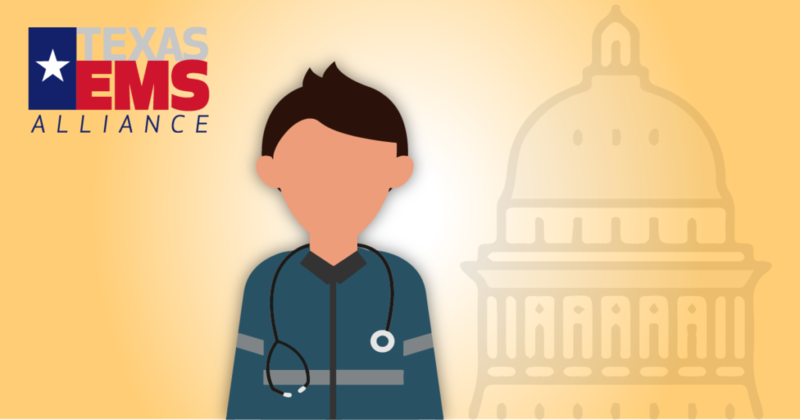 Laws and regulations affect every aspect of an EMS agency. As a result, TEMSA encourages Texas EMS agencies to engage in the public policy process to ensure that Texas communities have the best 911 service possible. 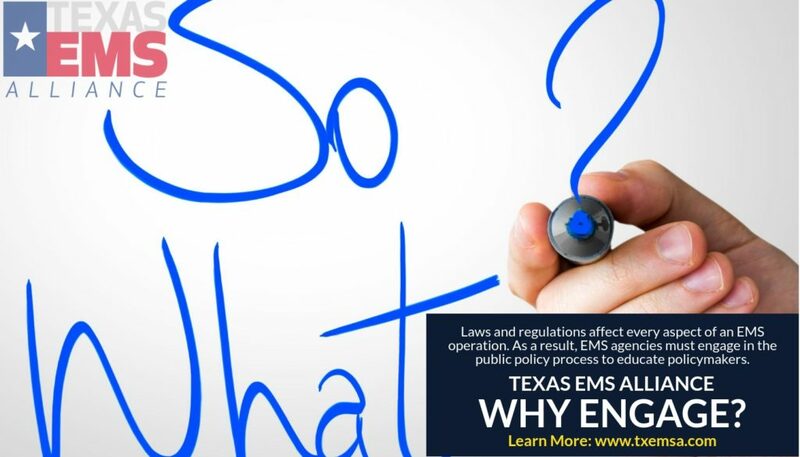 At a minimum, TEMSA asks its members to read TEMSA’s e-mail newsletters and participate in its conferences to learn more about the public policy issues that affect Texas EMS agencies. 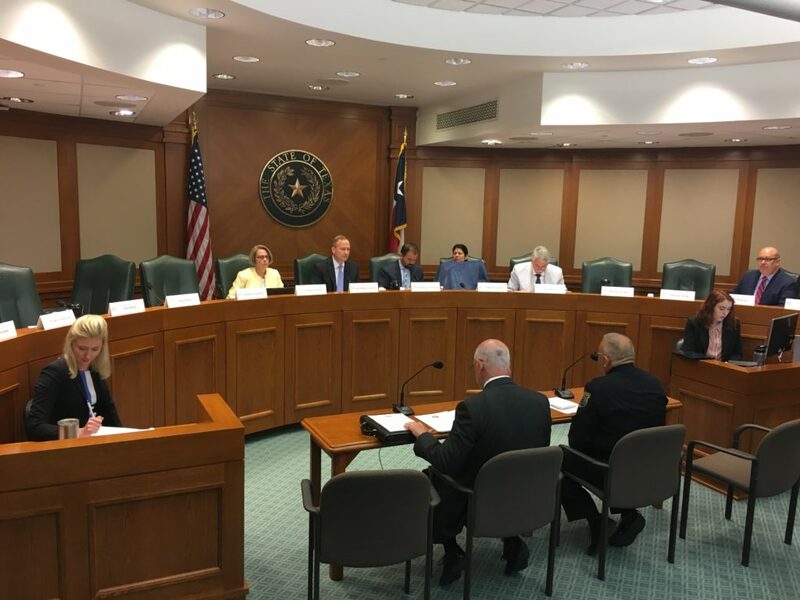 A number of Texas EMS agencies have taken their advocacy efforts to another level by testifying before the Texas Legislature and hosting lawmakers for site visits to learn more about EMS. 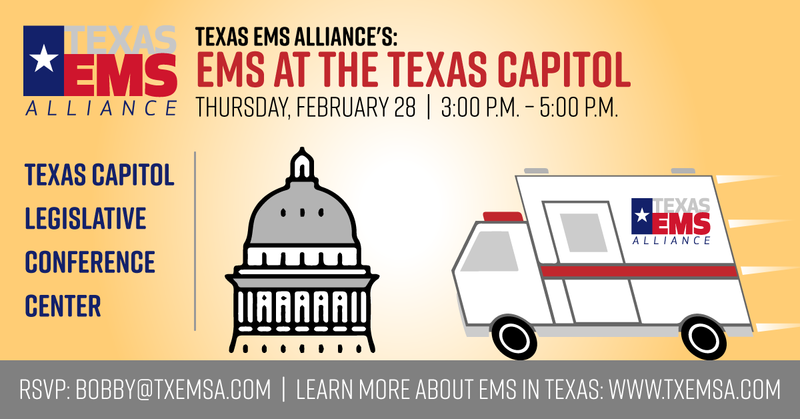 Over 200 lawmakers and aides participated in TEMSA’s EMS Day at the Capitol on February 28, 2019. Click here to learn more. Medicaid is a large payer for Texas EMS agencies. The current Medicaid payment rates for ground ambulances, which are already well below Medicare payment rates (Texas Medicaid pays 67 percent of Medicare ground ambulance rates), do not even cover the cost to transport a Medicaid patient. 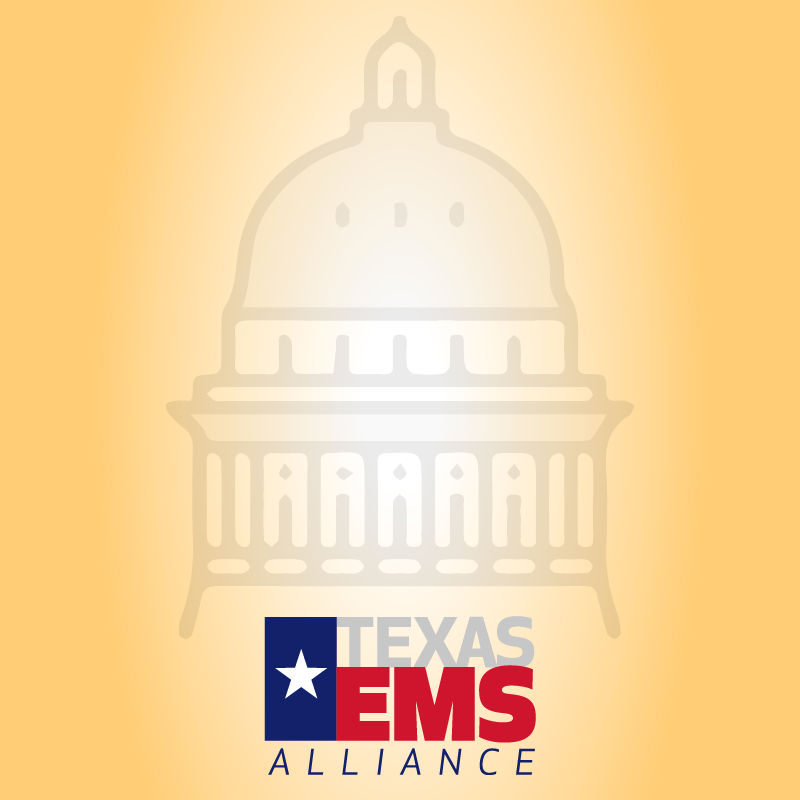 TEMSA is promoting two bills in the 2019 Texas Legislature that affect EMS agencies. HB 2333, which is a bill that relates to Medicaid bridge funding, would create the STAR Safety Net. Click here to learn more. In addition, TEMSA is pushing HB 2409, which would extend the state’s Medicaid supplemental funding program. 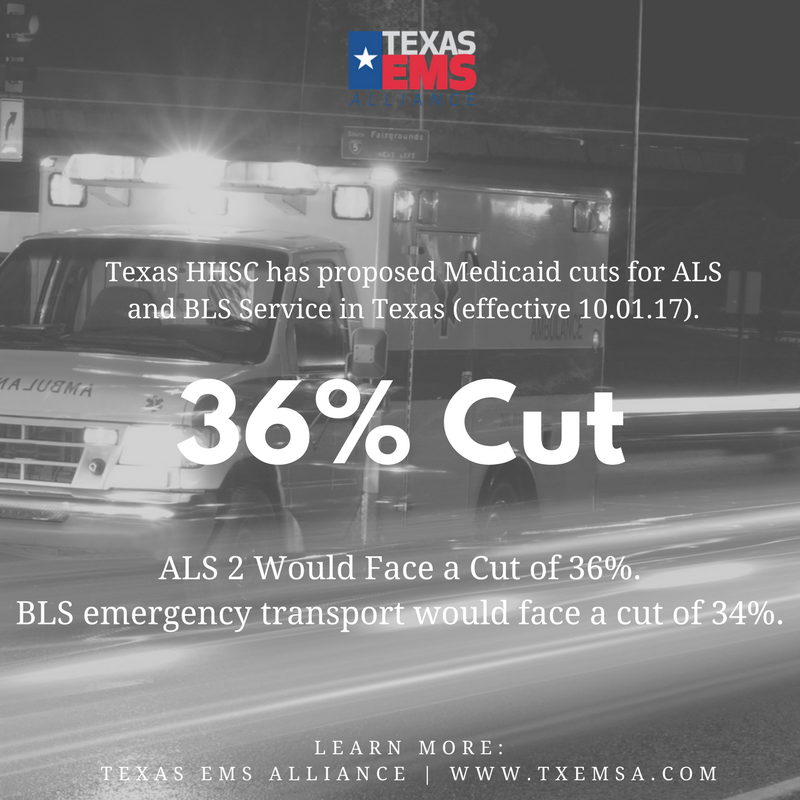 The Texas Health and Human Services Commission (HHSC) proposed new Medicaid rates in the summer of 2017 that would have resulted in significant cuts for ALS and BLS service in Texas. Through TEMSA’s work, multiple segments of the health care industry and 75 state lawmakers worked together to stop the cuts. Ground EMS would face a cut of a little over 1 percent for ancillary codes billed by ambulance providers. It affects neither ground ambulance base rates nor ground ambulance mileage. Fixed wing air mileage would face a cut of a little over 28 percent per mile. The proposed rate actions are consistent with the legislative directive in Rider 33, Article II of the General Appropriations Act for the 2018-2019 Biennium, that HHSC develop and implement cost containment initiatives, including fee-for-service payment changes that incentivize the most appropriate and effective use of services. Congress passed a spending bill in February 2018 that renewed the ambulance “Medicare extenders” for an additional five years. In addition, the bill directed the U.S. Department of Health and Human Services (HHS) to develop a cost reporting program for ambulances. The plan is due by December 31, 2019. The American Ambulance Association has created a series of seminars for TEMSA members to learn more about Medicare’s cost data collection program for ambulances. 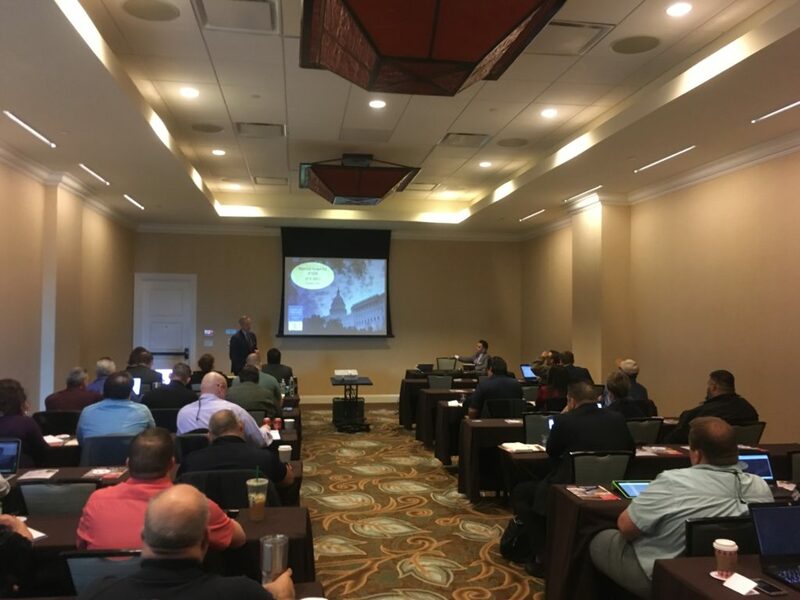 TEMSA held the first seminar during the November 2018 Texas EMS Conference in Fort Worth. 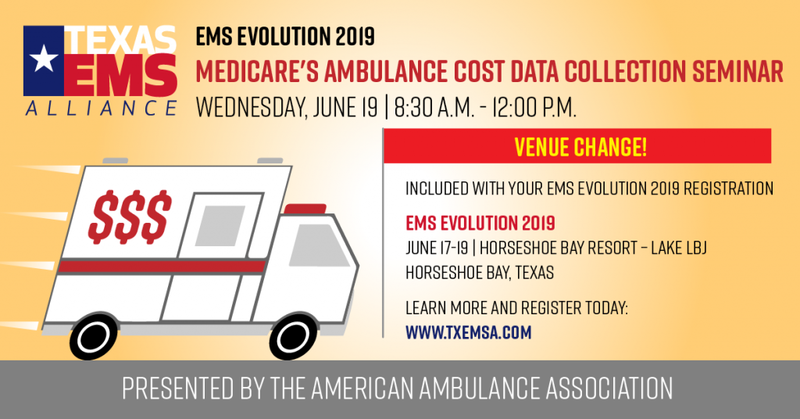 TEMSA will dedicate EMS EVOLUTION 2019’s morning of June 19 to another ambulance cost data collection seminar. Texas EMS agencies play a critical role in our state’s health care delivery system. The fast response and high level of care delivered by our state’s EMS agencies have saved countless Texas lives. In many rural Texas communities, EMS agencies are taking on a new role as the community’s health care safety net due to rural hospital closures. And for those rural communities that lack a rural hospital but have a primary care clinic, the EMS agency serves as the only health care option outside of business hours. The increased transport stresses the system as it takes ambulances out of the community for hours due to the fact that the ambulance has to travel further to transport to the closest hospital. The increased transport stresses equipment by adding additional miles to units, which results in a faster replacement for ambulances. The increased transport creates a need for higher levels of training and care. If you can transport a patient to an emergency department with a physician and a team of health care professionals in a few minutes, the care needed for transport is viewed as “routine” in the EMS arena. However, if a patient requires a 50-mile transport, for example, the level of care that you would need to provide during that time period is generally expected to be higher, which requires a higher level of training for EMS professionals. EMS agencies are not immune to the difficulties that are facing rural hospitals and other rural health care providers; rural EMS agencies are affected by the same funding struggles that rural hospitals face. Local Project Grants (LPGs) no longer exist, and they provided valuable capital equipment to rural EMS agencies in the past. In addition, rural EMS agencies often cite an aging workforce and small pool of EMS professionals available in the rural areas as one of their greatest challenges. The higher wages and a wider array of opportunities in urban areas often outweigh the benefits that can be provided by rural agencies. Click here to learn more about rural EMS in Texas. TEMSA board member Ernie Rodriguez of Austin-Travis County EMS testifying before the Texas House Committee on Public Health’s June 2018 hearing on rural EMS. 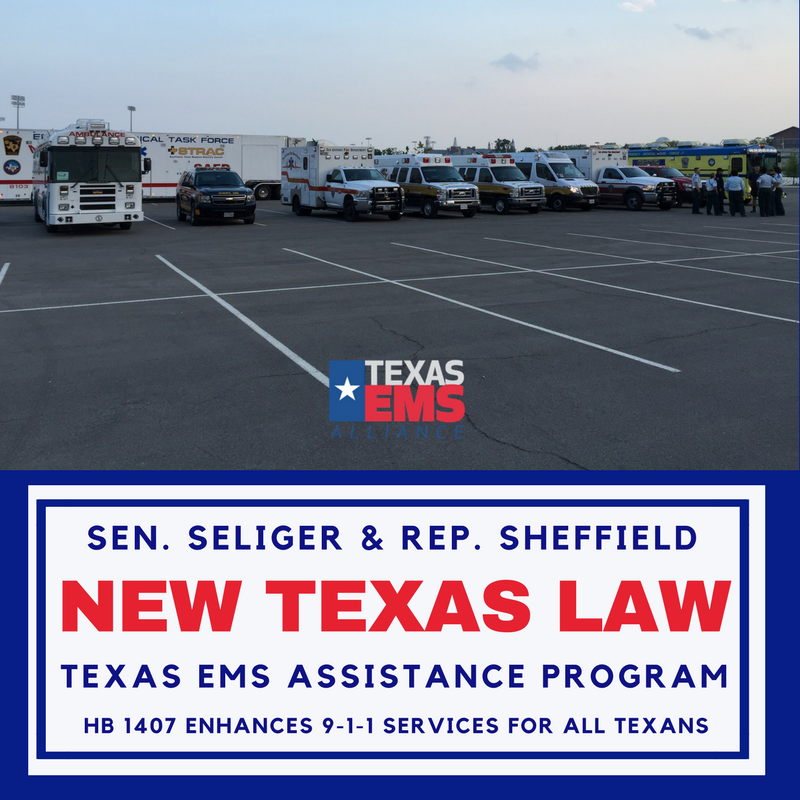 TEMSA worked with state lawmakers to create HB 1407 (the Texas EMS Assistance Program) in 2017. Governor Greg Abbott signed HB 1407 into law on June 15, 2017. HB 1407 creates the framework to preserve local project grants (LPGs) and develop a distance-learning program for rural paramedics. TEMSA is working with lawmakers to create funding mechanisms for the program. 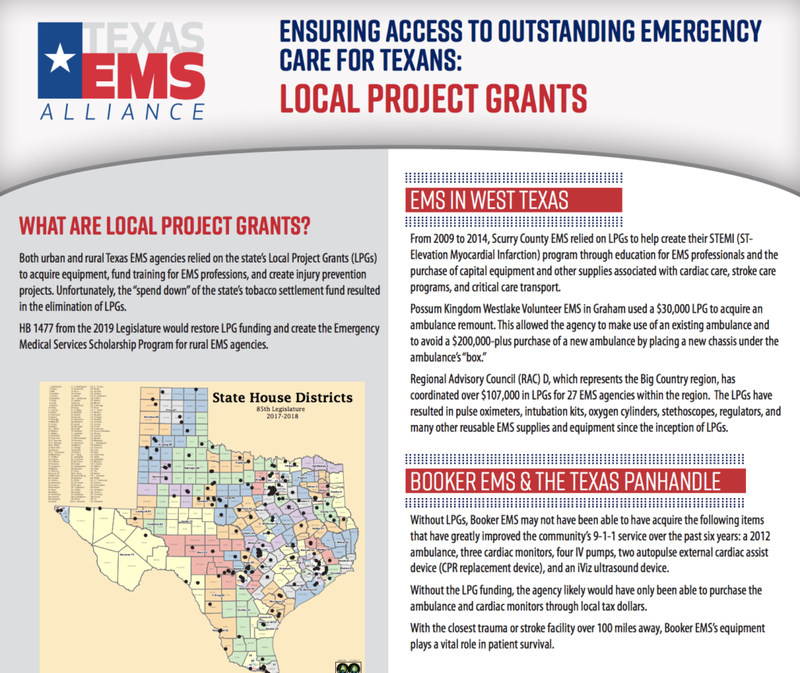 Local project grants (LPGs) have been a lifeline for many urban and rural EMS agencies. In the past, many EMS agencies relied on LPGs for capital equipment, injury-prevention projects, and continuing education for EMS professionals. From 2009 to 2014, Scurry County EMS relied on LPGs to help create their STEMI (ST-Elevation Myocardial Infarction) program through education for EMS professionals and the purchase of capital equipment and other supplies associated with cardiac care, stroke care programs, and critical care transport. PK Westlake EMS in Graham used a $30,000 LPG to acquire a 2012 ambulance remount. Without the grant, the volunteer agency would not have been able to replace its 2000 model chassis. These are just two examples of how EMS agencies utilized LPGs in the past. Unfortunately, LPGs are no longer an option for EMS agencies due to the depletion of the EMS and Trauma dedicated Tobacco Fund. The 85th Legislature did not account for LPG funding in the last session. TEMSA is encouraging the 86th Legislature to fund LPGs. Equipment costs have continued to rise, and the recent rule changes added a number of capital items that will be required on Texas ambulances (12 lead EKG, waveform capnography, etc.). For the rural EMS agencies that actually have to rely on fundraisers in the local community to help fund their operations, the availability of an LPG would be critical to ensure that the agency meets equipment requirements required by Texas regulations. 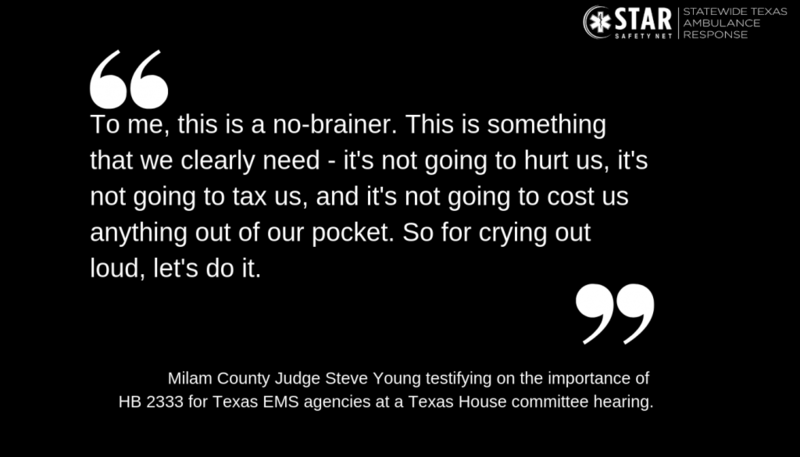 EMS agencies rely on funding from the Texas Legislature to ensure that communities have access to emergency services. Local project grants have served as a lifeline for many EMS agencies. Click here to learn more about HB 1477 in the 2019 Texas Legislature. 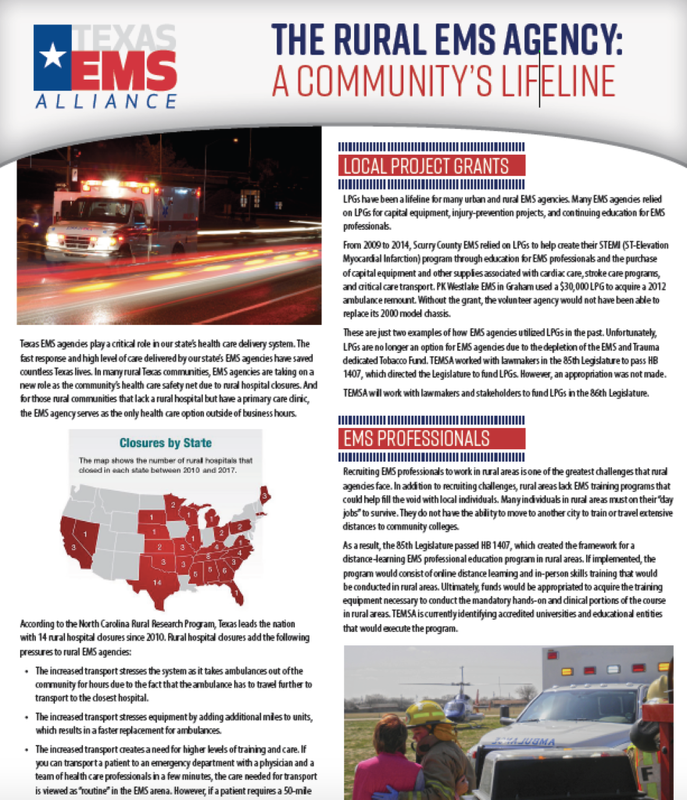 Local project grants (LPGs) have served as a lifeline for both urban and rural EMS agencies. Funded by the state’s “tobacco fund,” the LPGs funded capital equipment, personnel training, and other important initiatives for EMS agencies. However, LPG funding has expired. 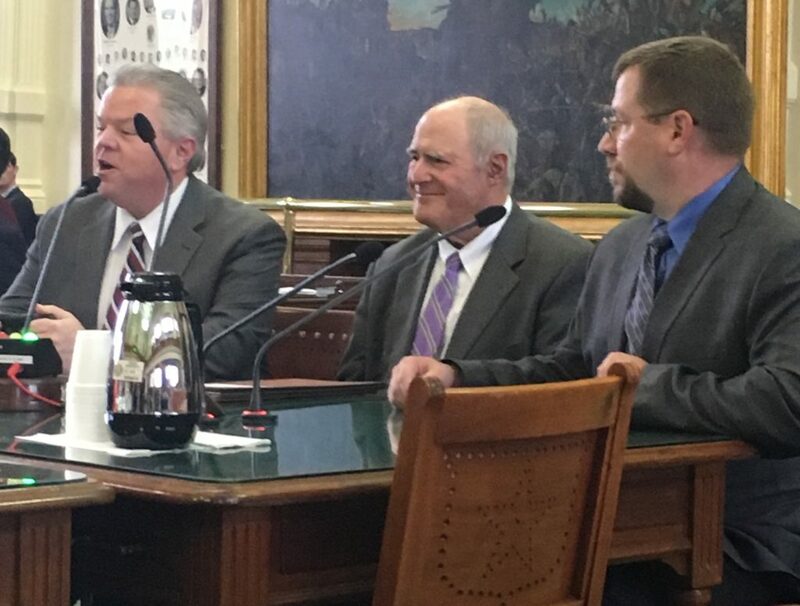 HB 1477 was filed in the 2019 Texas Legislature to restore LPGs and create the Emergency Medical Services Scholarship Program to provide tuition assistance to EMS professionals in rural areas. Click here to learn more about LPGs. Texas’ Driver Responsibility Program (DRP) serves as a primary funding source for the state’s emergency trauma program. However, the DRP will be challenged in the 2019 Texas Legislature. The Texas Tribune recently took a look at the future of the DRP on August 27, 2018. Click here to read the article. The 2017 Texas Legislature passed HB 1794, which directed Texas HHSC to create a work group on mental health access for first responders. Several TEMSA members serve on the work group. The work group released its recommendations for the 2019 Texas Legislature in January 2019. Click here to learn more. The Centers for Medicare and Medicaid Services (CMS) announced the new Emergency Triage, Treatment, and Transport (ET3) model for Medicare on February 14, 2019. The voluntary program will allow EMS agencies to use new strategies, such as telemedicine and on-site treatment, for low acuity responses. 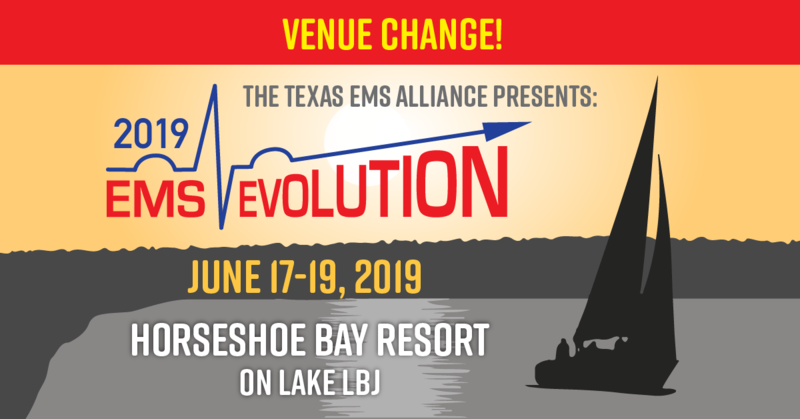 EMS EVOLUTION 2019 will feature a presentation on the subject. 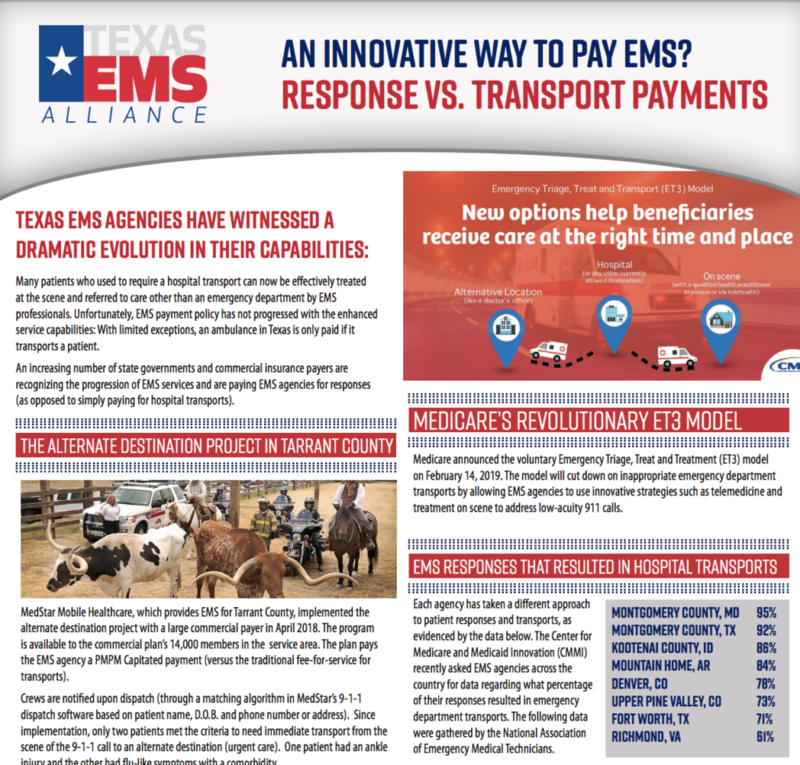 In addition, an increasing number of states have passed initiatives that would transition EMS payment policy away from the traditional transport payment concept and pay EMS agencies for responses. State Rep. Mando Martinez wrote a letter to HHSC Commissioner Courtney Phillips asking her to study the issue of response vs. transport payments for EMS agencies. Click here to view the letter. Click here to learn more to learn more about the issue.